For the Celts, simplicity wasn’t so much a question of externals–like furniture, architecture, and so forth. It was something internal, and it was founded upon the phrase, “Thy will be done”. This meant God’s will, not our own. It meant dying to oneself, not having opinions and not judging others. It reminded them that they must pick up and carry their own crosses in this life and follow Christ, for dying to oneself has always been the great secret of holiness. Nowhere was the Cross more loved and cherished than in the monasteries, where highly-carved and richly symbolic great “High Crosses”–some of them 15 feet and taller– were set up–many of them still standing today. These were not the suffering and bloody crucifixions found later in the West, particularly in Spain and Italy. Nor were these the serene and peaceful crosses of the Eastern Church. No, Celtic crosses were a genuine Christian expression all their own. Sometimes Christ is depicted, but often not; however, when He is shown, He is always erect, wide-eyed, and fully vested like a bishop, a great High Priest. In this form He is a symbol of victory over sin and death; He radiates invincibility. A common ascetic practice, even for the laity, was called crosfhigheall or “cross-vigil”, and it consisted of praying for hours with outstretched arms. St. Coemgen sometimes prayed in this position for days. Once he was so still, for so long, that birds came and began to build a nest in his outstretched hands. 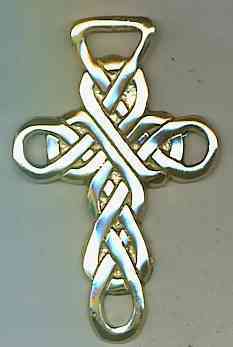 Scholars believe that the Celtic High Cross patterns probably came from Egypt. There are no loose ends in these patterns; this symbolizes the continuity of the Holy Spirit throughout existence–for God has no beginning and no end. “Unclothed Himself God Almighty when He would mount the Cross, courageous in the sight of all men. I bore the powerful King, the Lord of heaven; I durst not bend. Men mocked us both together. I was bedewed with blood. Christ was on the Cross. Scholars believe that these incredibly complex patterns probably came from Egypt, but also may have some Byzantine influences. It’s important to note that there are no loose ends in these patterns; this symbolizes the continuity of the Holy Spirit throughout existence–for God has no beginning and no end; only Christ is the Alpha and the Omega. The same is true of knot-work patterns, which are endless and cannot be untied. Spiral designs symbolized the Most High God Himself, the “motionless mover,” around whom all things move. Some of these are what are called “Crosses of the Scriptures” because they are decorated with panels illustrating scenes from the Bible. High Crosses possess an almost dream-like quality in their complex geometric patterns, dignified and strong, heroic and towering over men, and yet also reminding those Christians of the Christian doctrine of kenosis, the self-emptying of Christ. And yet, with all of this sober asceticism, the Celts never lost their native enthusiasm, exuberance, and just plain cheer, as we see in a prayer written by the wonderful 5th century Abbess, Brigit, when she exclaims: “I should like a great lake of ale for the King of Kings; I should like the angels of heaven to be drinking it through time eternal!” How could anyone fail to be charmed by such a character–a woman who was a great leader of monastics, both men and women, who was baptized by angels, got out of an arranged marriage by plucking out one of her eyeballs, and fell asleep during a sermon given by the incomparable Equal-to-the-Apostles, St. Patrick! 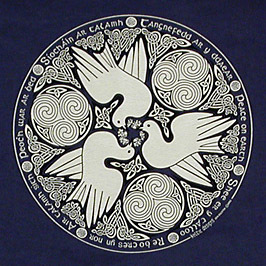 Brothers and sisters: the sanctity of Celtic monastics is a model for us in that it combines heroism and joy in perfect and beautiful balance. For them, the heroic life was one completely dedicated to living intimately with the God-Man whom they described as “victorious,” “mighty and successful,” “the lord of victories,” a great warrior to whom they pledged undying, fearless, creative and exuberant loyalty. And yet, for all of their heroism, their monastic world-view, could be ‘summed up as the ‘Christian ideal in a sweetness which has never been surpassed.’” (Nora Chadwick, quoted by Joyce in op.cit.) To slip into their world, even for just a few moments, as we’ve done here this afternoon, is, I believe, is not just inspiring; it’s almost breathtaking. in that peace I stay. in Thee is no gloom. For more information on Celtic Orthodoxy, go to http://www.mullmonastery.com and follow father Seraphim’s pilgrimage and struggles to found the first Orthodox monastery in the Hebrides in over a millennium. 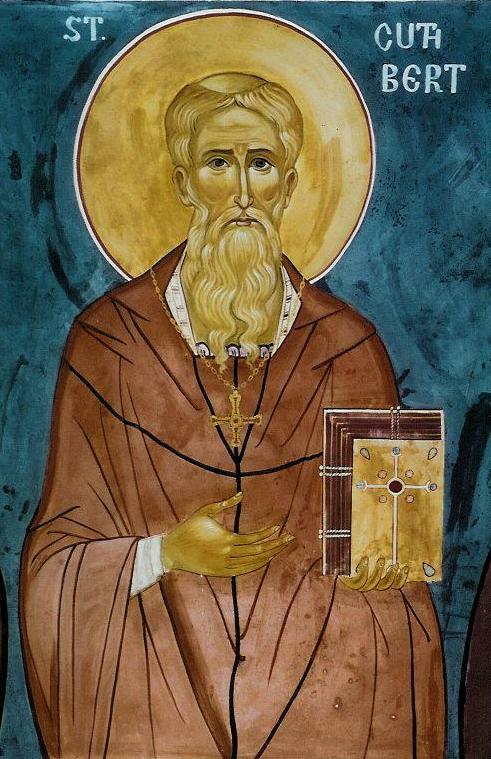 This entry was posted in Celtic Orthodoxy, Monasticism and Monastery Lessons and tagged celtic cross, celtic monasticism, Celtic Orthodoxy, Celtic Saints.